Our own house made corned beef hash served with two eggs and home fries. Two poached eggs and Canadian style Bacon served on a toasted English muffin, then covered with a creamy hollandaise sauce. Layers of tomato, fresh spinach and avocado between the English muffin and your poached eggs, then drenched in the hollandaise sauce. Sauteed beef, onions, spinach, mushrooms, and cheddar cheese. Three eggs any style with your choice of ham, bacon, or link sausage. Includes home fries or pancakes, coffee, tea, milk or fruit juice. A complete breakfast to start your day off right. Two eggs scrambled together with diced ham. Served with three pancakes. Choice of bacon, ham, link sausage, 1/4 lb. beef patty or Italian sausage patty. Includes home fries or three pancakes. With home fries or three pancakes. Bacon, avocado and mushrooms, graced with tangy feta cheese. Potatoes smothered with country gravy and two eggs. Broccoli, onion, tomato and sweet red pepper topped with jack cheese. Ham, sausage, bacon and Italian sausage. Topped with cheddar cheese. Our rich thick chili con carne topped with cheddar cheese. Your choice of ham, bacon, or sausage with red onions, bell peppers, and cheddar cheese. Breaded beef steak smothered in our sausage gravy, served with two eggs, home fries and a biscuit or your choice from our Baker's Basket. Avocado, spinach and jack cheese. Bacon, avocado, mushroom and jack cheese makes this Carol's favorite omelette. Made from a thick rich chili con carne and mild Wisconsin cheddar cheese. Your choice of ham, bacon or sausage with mild cheddar cheese. Your choice of any single ingredient from our omelette selection. Add jack, Swiss or cheddar cheese. Diced ham, onion, bell pepper plus cheddar cheese. Spinach, bacon, tomato and hollandaise sauce makes this unique omelette a winner. Non-dairy, no cholesterol Egg Beaters, zucchini, onion, bell peppers, mushrooms, and tomato. Chunks of ham, sausage, bacon and Italian sausage topped with cheddar cheese. Italian sausage, green chilies and Swiss cheese. Spicy but delicious. Six pancakes with bits of crisp bacon in buttermilk batter. Six buttermilk pancakes served with hot blueberries. One egg, any style, on top of two large buttermilk pancakes, your choice of two link sausages or two strips of bacon. Six buttermilk pancakes covered with tart, hot raspberries. Four buttermilk pancakes served with your choice of hot fruit topping. Four pancakes, your choice of buttermilk or buckwheat. Six buttermilk pancakes topped with hot strawberries. Three link sausages rolled in delicious pancakes. Two slices of our French toast topped with Swiss cheese and thinly sliced ham, then covered with our home-style country gravy. Our French toast, graced with mild cheddar and bacon strips. Two slices of extra thick egg bread dipped in egg batter and served with powdered sugar. Two slices of our French toast, one egg any style, choice of two link sausages or two bacon strips. Crisp bacon right in the waffle. A crisp golden waffle with whipped cream and sliced bananas. 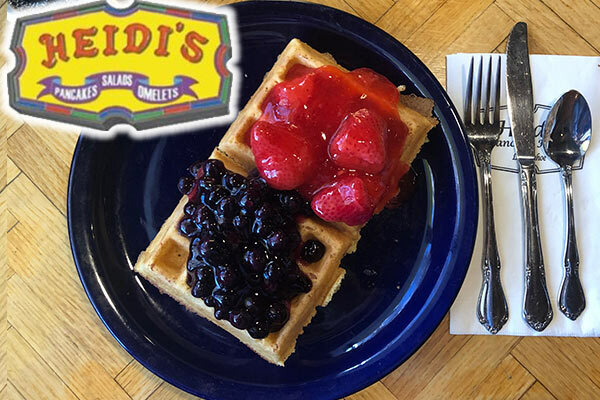 A crisp waffle served with whipped cream and your choice of hot strawberry, blueberry or raspberry toppings. Our salute to the red, white and blue. Strawberries, whipped cream and blueberries. A crisp waffle with any style egg and your choice of two link sausages or strips of bacon. Fresh banana and sour cream. Three sour cream crepes smothered in tart raspberries and sour cream. Three sour cream crepes in a blanket of hot blueberries. Three crepes with strawberries and whipped cream. Three traditional crepes served simply with butter, powdered sugar and a lemon wedge. Three crepes served with any style egg and your choice of two link sausages or two strips of bacon. Sliced turkey, avocado, bacon, lettuce and tomato. Sliced avocado, spinach, tomato, sweet red pepper, cucumber, Swiss and cheddar cheese. Served on a fresh baked croissant. Please ask your server about the selection of the day. Sliced avocado, bacon, cheddar cheese and sour cream, then grilled to perfection. Thinly sliced ham, turkey and Swiss cheese, tucked between slices of grilled, batter-dipped egg bread. Three pieces of crispy fried chicken served with French fries and your choice of BBQ or ranch dipping sauce. Italian sausage on a French roll with jack cheese. Beef patty, onion and Swiss cheese on a grilled rye swirl. Heidi's version includes thinly sliced roast beef with sauteed onions, green chilies and red peppers with melted Swiss and American cheese. Served on a grilled French roll. Sliced turkey breast, green chilies, tomato and jack cheese on grilled sourdough bread. Two slices of bacon, tomato and American cheese. Served on grilled sourdough. Onions, green chilies and jack cheese. Served on sourdough. Topped with thinly sliced ham and Swiss cheese. Grilled on fresh sourdough. Tender chicken breast, steamed on the grill, served with toasted bread, spinach and tomato. Ham, turkey and a variety of cheeses with assorted seasonal garnishes on a bed of lettuce. Tossed vinaigrette salad with chicken, avocado, sweet red pepper, green onions, tomato, cucumber and hard boiled egg. Grilled chicken breast seasoned with Salsa Brava. Served over garden greens with avocado, sour cream, tomato, green onions and a lemon wedge. A cup of today's hot soup and a fresh garden salad. Feta cheese, Bermuda onion, black olives, minced egg and dried cranberries, topped with your choice of dressing. With fresh mushrooms and Swiss cheese. Two strips of bacon and American cheese. Topped with avocado, jack cheese and spinach. Pick your cheese, American, Swiss, cheddar or jack. Sliced avocado, mushrooms, bacon and jack cheese. No cheese, no topping, just a darn good burger. Served with spicy chili con carne, onion and cheddar cheese.